The International Festival of National Sweets will gather together participants from 15 countries, Azerbaijan's National Cuisine Center reported. Along with the national sweets, participants of the festival will present their national costumes in the special pavilions equipped with household items, rugs, related to their countries. The event will be attended by representatives of UNESCO, the World Association of Chefs' Societies, as well as various international organizations. Guests of the festival will be able to enjoy Azerbaijani desserts as well. During the festival, the regions of Azerbaijan will present their sweet dishes like lipsmacking firni, khashil and sweet pilaf. A lot of national pastry including delightful baklava, fasali, umach halva, as well as a variety of traditional sweets like nogul and samani halva will be presented to the visitors of the festival prepared by cooks from different regions of Azerbaijan. The event will be co-organized by the National Cuisine Center Centre, Azerbaijan's Culture and Tourism Ministry, Azerbaijan's National Cuisine Association and the executive authority of Shaki. Azerbaijani cuisine is one of the most interesting ones in the whole world and the Orient in particular and sweets take significant place here. Besides tasting traditional dishes like dolma and pilaf, no foreigners even those who are keep a diet, can resist tasting wonderful sweets in Azerbaijan. Some of them even take delicious pastry abroad instead of souvenirs to feast their friends. It is a well-known fact that Azerbaijanis are heavy tea drinkers, so it is no wonder that various sweets and jams are very popular here. 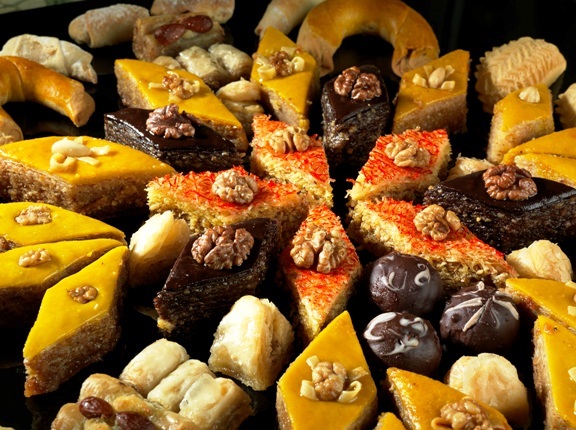 The Azerbaijani sweet pastries include more than 30 varieties with poppy seeds, walnuts, almonds, sesame seeds, ginger, cardamom, which make it spicy and especially tasty. Every region of Azerbaijan has its own special recipe for local sweets, which may even have different shape depending on the traditions of the region. Baklava and shekerbura - adornments of Novruz holiday- are among the most famous Azerbaijani sweets.